Only when riders progress to the top of the riding tree are they finally capable of influencing a horse to teach it something new or to remind it about something it already knows. Their communication is clear enough and accurate enough that they can use the language of aids pressures to show the horse new shapes. They have developed an independent seat and muscle memory of the correct aids. They have developed a sense of timing. They have independent control of each body part so they can apply any aid with varying degrees of pressure. As the horse moves underneath them, they relax and follow its motion in perfect balance. When we train horses, the first step is showing them what we want them to do. Then we can ask them to do what we’ve shown them. Once they fully understand what we are asking, we can tell them to do it. If we know they understand what we are telling them but they refuse to do it, we can enforce our request. Beginning riders can only ask their horses for shapes and movements because they lack the necessary skills to demand more. At this stage, many instructors use forgiving Oldie Goldies to help riders learn to relax, find their balance, and learn to follow the horse’s motion. As they progress up the riding tree and learn to both apply and coordinate their aids, riders can begin telling their horses what to do. By interpreting the horse’s response, they can continue improving their coordination skills. By riding many different kinds of horses, they deepen their skills. 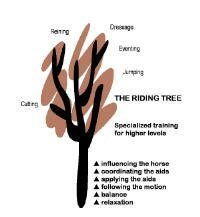 At the lower levels on the riding tree, their horses are their teachers. When riders become very good at coordinating the aids, they become capable of influencing the horse. Now they can show a baby green horse what to do or enforce the requests made of a spoiled horse to retrain it. They have the necessary skills to use artificial aids like a whip or spurs to reinforce their requests without ruining their communication with the horse. The riders have now become capable of teaching. The reason the combination of a green horse and green rider is so disastrous is that neither one is capable of teaching the other. Neither one can give the other the necessary feedback so that learning can take place. Similarly, until a rider is quite far along on the riding tree, he or she lacks the necessary skills to enforce a request when a horse deliberately refuses to respond. A lot of school horses who know the game cheerfully choose to ignore beginning riders. So fairly early on we do allow students to carry crops to reinforce their leg aids. However, no one wears spurs until they have an independent seat and time their use correctly. Riders must be able to ride stride by stride and influence the horse with precise timing and degrees of their aids before they can create something new or enforce something the horse already knows. The difference between coordinating the aids and influencing the horse is very subtle. It involves control of the rider’s and the horse’s emotions as well as their bodies. The ability to interpret and judge the horse’s feedback becomes very important at this stage because it determines the riders’ responses. They must be sure they coordinated their aids correctly and precisely. They must judge whether the horse simply didn’t understand the aids. Or they must judge that the horse understood the aids but chose not to respond correctly. Since, in the latter case, the timing of any enforcement is critical for successful communication and correction of the problem, riders at this level need to make their judgments in a split second without any emotional involvement. The horse must feel that their response is horse logical and fair. Making these judgments takes experience riding many different kinds of horses. It’s not possible for anyone to judge correctly all of the time no matter how far they go in their riding. When you know that a horse understands something and is choosing not to do it, there is always the possibility that something is physically wrong. New tack may be bothering him. He may have sore muscles from a workout the day before. He may have caught a virus at a show the weekend before. Instead of enforcing his or her request, the rider may have to reevaluate the training plan for that day and give the horse an easy workout or even a complete rest. When riders become trainers, they are going to be evaluating their horses every day. When they work with a horse every day for months they get to know its personality, its little nuances, and it becomes easier to judge whether the horse’s refusal to listen to the aids stems from soreness or stubbornness or mental burnout. If a horse that normally goes along with everything suddenly turns surly, it’s also OK to say let’s just go out and play on the trails. Give the horse a day off and see what happens. All of that is a judgment call on the trainer’s part. Sometimes it seems like it’s going to take a long time before a rider reaches the point when they can influence a horse or enforce their requests. Don’t get discouraged. Remember that you’re going to reach different levels on the riding tree on some horses at some gaits at least some of the time before you experience it on all horses at all gaits all of the time. Just keep riding.